Electricity makes our lives better, brighter, and cleaner. After electricity is generated at a power plant, it needs to be transmitted on high-voltage power lines before it can be distributed to our homes and businesses. This page focuses on the middle stage—electricity transmission from power plants to local distribution grids. In many ways, electricity transmission is the unsung hero of our modern, electrified economy. The U.S. transmission grid delivers power so reliably that widespread blackouts—like the Northeast blackouts of 1965 and 2003—are rare, unforgettable moments in U.S. history. In the past, the transmission grid has been reliable. Yet in the future, that might not be the case, as new laws and regulations threaten to make the grid unstable. In the 1880s, electric lighting systems were some of the first applications of electricity to modern American life. In those early systems—like Thomas Edison’s Pearl Street Station in Manhattan, which energized America’s first power grid—electric power stations served customers in a small network that covered only a few city blocks. One of the biggest differences between the small electricity grid at Pearl Street and the electricity we use today is that Edison used direct current (DC), while today’s grids use alternating current (AC). Early power grids were small by today’s standards, in part because of the physics of direct current networks. DC networks had to operate at low voltages in order to be safe, the downside being that transmitting low-voltage power is inefficient. Much of the power is lost in the form of heat, and the power simply cannot be transmitted very far. In fact, Edison’s Pearl Street Station had no “transmission” component, as we use that term today. Copper wires buried underground carried power only a short distance from the station to the electric lamps of Edison’s customers. Pearl Street was a huge leap forward—some call it “the beginning of modernity”—but grids powered by direct current only worked in densely populated areas like lower Manhattan. It was nearly impossible for anyone to implement on a wider scale. A Serbian-American inventor named Nikola Tesla is the most famous of the electrical engineers who revolutionized the way we transmit electricity. Working with entrepreneur George Westinghouse, Tesla and the early AC engineers made long-distance electricity transmission possible. Instead of generating DC power, their solution was to generate a completely different kind of electric power—AC—and to use new transformers to increase and decrease the voltage. That was the beauty of the AC breakthrough: it meant that electricity could be transformed from low to high voltage and back, which increased the efficiency of transmission and allowed Westinghouse’s early transmission lines to span longer distances. In 1893, Westinghouse and Tesla saw an opportunity to prove that AC was the system of the future to an audience of millions at the Chicago World’s Fair. The Westinghouse Corporation underbid General Electric (Edison’s former company) to win the contract to light the fair, and Westinghouse and Tesla went on to produce a spectacular display of nearly 100,000 electric lights for President Grover Cleveland and 27 million other visitors over the course of the fair. “The lamps that laced every building and walkway produced the most elaborate demonstration of electric illumination ever attempted and the first large-scale test of alternating current. 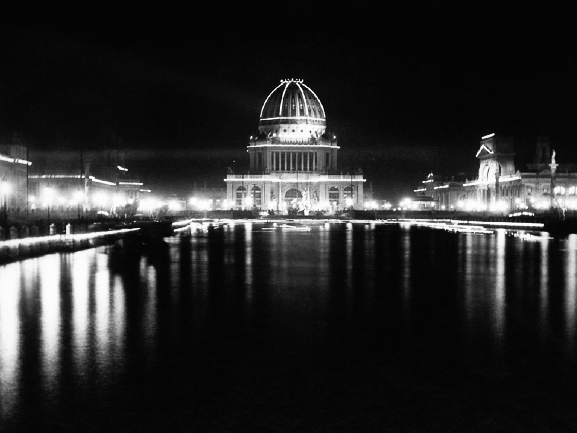 The fair alone consumed three times as much electricity as the entire city of Chicago. These were important engineering milestones, but what visitors adored was the sheer beauty of seeing so many lights ignited in one place, at one time.” The Devil in the White City, by Erik Larson. Later in 1893, the Niagara Falls Power Company awarded Westinghouse a contract to harness the power of Niagara Falls and to deliver it to Buffalo, New York—22 miles away—using his new AC technology. With the help of Tesla and other electricity innovators, Westinghouse Electric Corporation built a hydroelectric power station at Niagara that would again test AC technology. The team of engineers at Westinghouse’s company had to build custom transformers to increase the voltage of the power generated at Niagara from 2,200 to 11,000 volts before placing it on transmission lines. Westinghouse’s new transformers allowed him to send power efficiently first to Buffalo, New York, and ultimately all the way to New York City as more generators came online at the station. “Broadway was ablaze with lights” powered from hundreds of miles away by the station at Niagara. 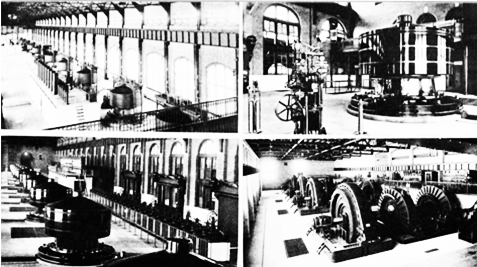 As the Niagara Falls Power Company recounted in 1927: “At Niagara the great step was taken in the transition from…local mechanical power to the new era of universal electrical power.” No longer would power need to come from the factory floor or a generator nearby— instead, generators could supply power from hundreds of miles away. Samuel Insull, a pioneering young businessman who had worked as Edison’s assistant and then business partner, had a breathtaking vision for electricity in the era of long-distance transmission. 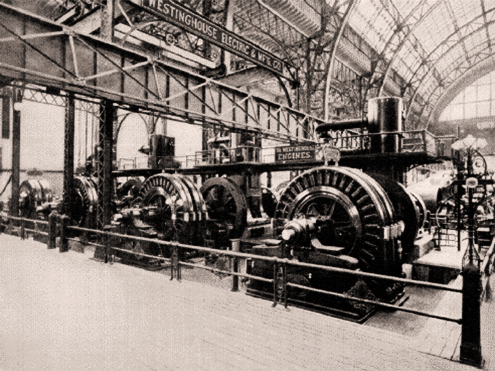 Edison encouraged Insull to test the boundaries of their business. “Do it big, Sammy,” he instructed. “Make it either a big success or a big failure.” In 1892, Insull left Edison’s former company in the New York area to pave his own way with a growing electricity company in Chicago (Chicago Edison, now Commonwealth Edison). Pushing the physical and economic limits of the high-voltage AC transmission system, Insull revolutionized the electricity industry by building larger generators and by transmitting power over longer distances. Year after year, his Chicago-based company brought the cost of electricity down while significantly increasing the number of people with access to it. By 1911, Insull’s AC grids spanned entire states. At the same time, Insull was influential in creating the regulatory framework for electric utilities, which is still generally intact. Insull’s focus on spreading electricity to new customers made him one of the great “democratizers” in American history. By the end of the 1920s, his companies were serving more than four million customers in 32 states. He would go on to network his transmission facilities with those of other companies, creating an interconnected web of electricity that powered cities and farms alike and laid the foundation for today’s power grid. The characteristic feature of modern electricity transmission is the high-voltage power lines that stretch across the entire continent. In the U.S., there are over 200,000 miles of high-voltage transmission lines (i.e., 230,000 volts and above)—enough to wrap around the Earth more than eight times. All of these lines networked together create a type of superhighway that moves electricity from the power plants where it is generated to local distribution systems, which ultimately deliver it to homes and businesses. In the continental U.S., we have three large, independent AC grids: the Eastern Interconnection, which covers the eastern two-thirds of the US; the Western Interconnection, which covers the western third; and the Texas Interconnection, which covers 85 percent of the state of Texas. Each has multiple utilities and independent power producers supplying electricity to the grid, and different pieces of the grid are owned by a patchwork of utilities, municipalities, federal power marketers, and independent transmission companies. The three interconnections each represent synchronized machines humming at the same frequency (60 hertz) and are considered some of the largest machines on the planet. The grid is actively monitored 24 hours a day by various grid operators, also called balancing authorities. These balancing authorities work to keep the electric grid in balance at all times by making sure that the supply of electricity meets demand in real time. Currently, no technology exists that can store electricity cost-effectively on a large scale. For that reason, balancing authorities rely on generators to respond to changes in demand at a moment’s notice. In the video below, the BBC explores the challenge of keeping the British National Grid grid in balance in the face of demand fluctuations. In the U.S., the same fundamentals are at work at grid operation centers across the country—each day, grid operators carefully match available supply to the demand on the grid. We don’t experience the “tea time pick-up” shown in the video above, but demand on grids in the U.S. does fluctuate throughout the day. 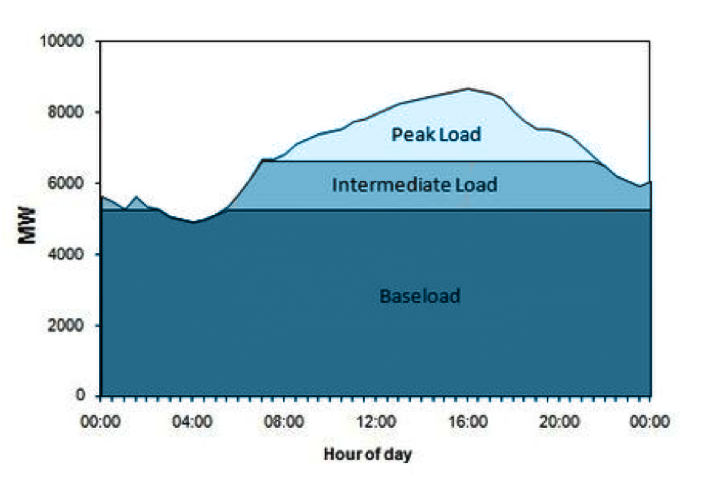 Below, we see a typical “load curve,” which is an illustration of the level of demand at different times of day. It is the task of grid operators to increase and decrease supply to follow this curve, second by second. About 6 percent of the power generated today is lost in transit (converted to heat by resistance from wires). We transmit power at high voltage because it makes for more efficient transmission by limiting these so-called “line losses.” Even materials that are excellent conductors of electricity (such as metals like copper and aluminum) provide some resistance to the flow of electrons, and the accompanying power loss be substantial over long distances. How high is “high voltage”? As it leaves the power station, electric power is typically stepped up to anywhere from 69,000 to 765,000 volts. 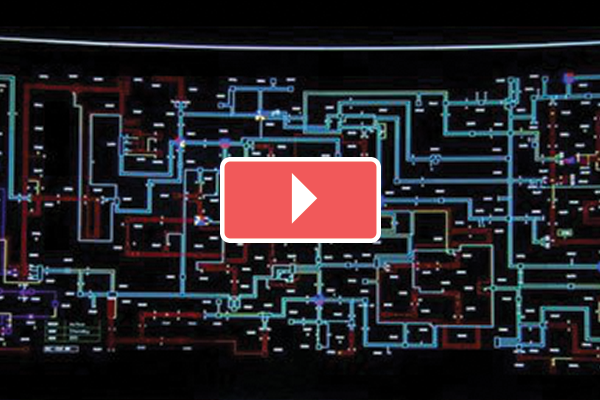 Compare this to the electricity in your home, which comes in around 120 to 240 volts. Transmission makes up roughly 11 percent of the total cost of electricity. In 2012, the Energy Information Administration estimated that transmission cost 1.1 cents/kilowatt-hour (kWh), out of the average electricity price of 9.8 cents/kWh. Although transmission represents a small portion of the overall cost of electricity, building and expanding the electricity transmission infrastructure is expensive. The transmission system’s size and complexity are significant barriers to entry for new companies, owing to the massive initial capital investment needed to transmit power. Transmission projects cost hundreds of millions of dollars and require long lead times and many right-of-way easements. Because of these high capital and administrative costs, the transmission system exhibits what economists call “economies of scale.” That is, as the system gets larger, the cost per unit of electricity goes down, and it becomes increasingly difficult to build a competing system that is economical. 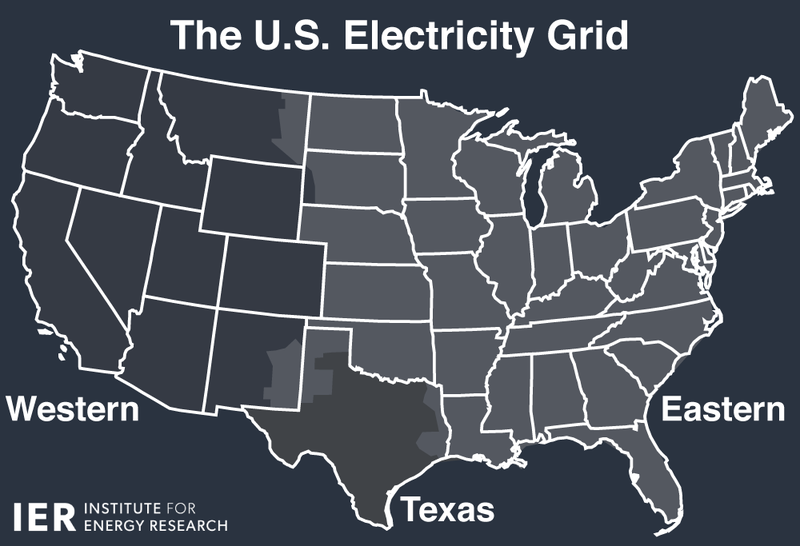 As a result, economists consider electricity transmission a “natural monopoly,” where only one utility will supply a given area with just one grid. The unique economic structure of transmission is one of the main justifications for government regulation in this industry. Electricity transmission (together with generation) comprises the “bulk power system,” essentially the wholesale side of the electricity business. Organized wholesale markets—often referred to as Regional Transmission Organizations (RTOs)—now deliver power to about two thirds of the country. With real-time (or spot) markets as well as day-ahead markets for electricity, prices within RTOs reflect electricity supply and demand conditions as well as transmission congestion (bottlenecks). By pricing transmission congestion, RTOs drive transmission investments to the parts of the grid that are constrained. They also make wholesale markets more transparent and allow the conditions on the grid to be visualized with the help of a price contour map. Prices in wholesale markets vary by location. Also called locational marginal prices or LMPs, they reflect the marginal cost of electricity generation plus a transmission premium. Some grid operators explain the cost of transmission congestion as part of the “taxi fare” for each megawatt of electricity’s trip—the higher the congestion or traffic on the grid, the higher the fare. The map above indicates some temporary transmission congestion on the grid in the Midwestern U.S. on the evening of September 1, 2014. As a result of transmission constraints, the low-priced electricity in the blue area is unable to reach areas where the demand for electricity and prices are slightly higher (green and yellow areas). The future of the electricity transmission grid is generally bright, with investment now hitting its highest levels in decades. According to the Edison Electric Institute (the electric utility trade group), “shareholder-owned electric utilities are investing more than $64 billion on transmission construction between 2013 and 2016.” These investments ensure that the transmission system is reliable, efficient, and supportive of a variety of generation sources. According to the most recent data from the Energy Information Administration, investment in the transmission grid totaled over $14 billion in 2012. But transmission investments are not all created equal. Some transmission investments are driven organically by market signals or reliability concerns, for example, and other investments are driven by politics. This is an important distinction when talking about the level of transmission investment because political investments may not directly improve the reliability or the economic efficiency of the grid. 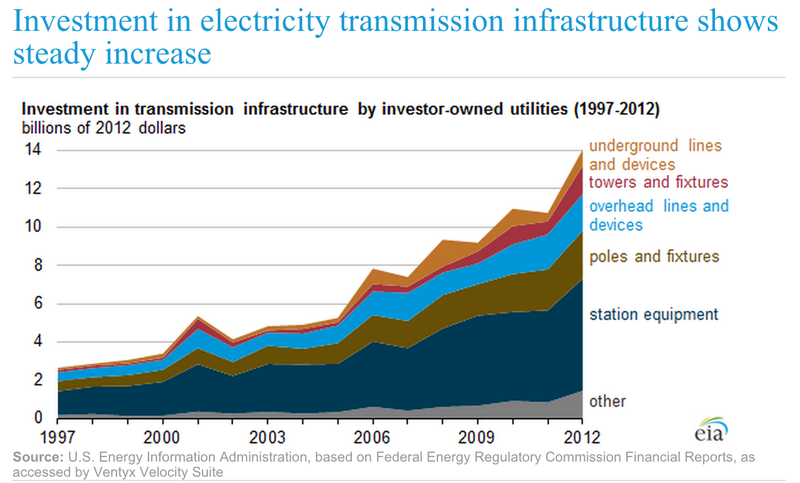 As the Edison Electric Institute writes in its March 2014 Transmission Projects At A Glance: “Of the total $60.6 billion worth of transmission projects highlighted in this report … projects supporting the integration of renewable resources represent approximately $46.1 billion (76 percent).” Clearly, renewables are playing a huge role in transmission grid investment. But because the influx of renewable generation projects is in turn driven largely by policies—such as the wind production tax credit and state-level renewable energy mandates—much of the observed increase in transmission investment can be attributed to political rather than market drivers. Indeed, many calls for increased transmission investment come from renewables advocates and politicians pushing for increased adoption of wind and solar power. Other federal policies are quietly driving transmission investment towards far-away renewable projects like wind and solar facilities. 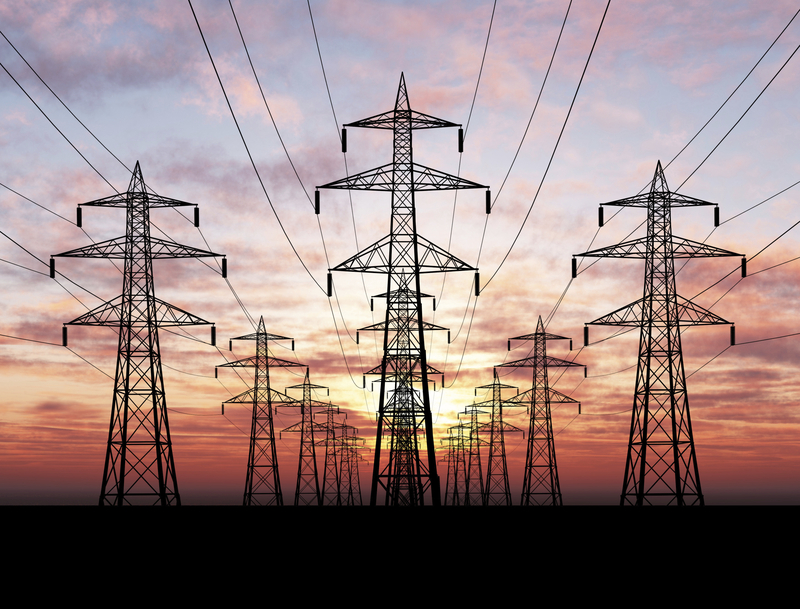 The Federal Energy Regulatory Commission (FERC)—the agency responsible for overseeing the transmission grid—recently issued a rule called Order 1000 that specifically orders transmission expansion plans to incorporate investments driven by politics. Notably, it also requires the associated costs to be socialized. Order 1000, along with other policy changes stemming from the Energy Policy Act of 2005, is certainly increasing the level of investment in the transmission grid. Whether or not the investments are wise remains to be seen. In contrast, market-driven investments in transmission lines increase grid reliability and reduce transmission congestion by focusing on the highest-valued grid improvements. Using the example of the color-coded price map, these investments allow existing low-cost power to reach the areas where it is needed most. Interestingly, FERC does not have jurisdiction over the Texas Interconnection. There is no interstate transmission in the Texas Interconnection (it is all within the state of Texas), so FERC has no authority there. 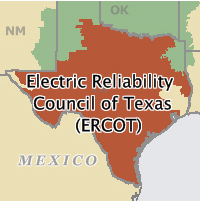 The Texas Interconnection is instead governed by the Electric Reliability Council of Texas (ERCOT). Far from the market-based alternative to FERC regulation, however, ERCOT rules also mandate a high level of transmission investment specifically designed to reach intermittent renewable sources of electricity (through its so-called Competitive Renewable Energy Zones). Many cite ERCOT as a success story, but the transmission upgrades needed to capture the West Texas wind cost $7 billion, which is ultimately borne by ratepayers. Thanks to the work of innovators like Nikola Tesla and Samuel Insull, we have reliable and affordable electricity transmission today, but we must continue to work to make sure electricity transmission remains so for future generations of Americans. That starts with an appreciation of how far we have come and how fortunate we are to have access to the electricity that powers our lives. A note on buying “green” power: In each of the interconnections discussed above (Eastern Interconnection, Western Interconnection, and ERCOT), the electricity flowing through the transmission grid is part of a “power pool.” All of the electricity on the same grid is, in a sense, mixed together. There is no way to distinguish between the electrons generated by renewable sources and those by fossil fuels. In other words, the transmission grid does not keep “green” power separate from conventional power. For that reason, programs that claim to offer customers “100 percent green” power are more symbolic than literal.